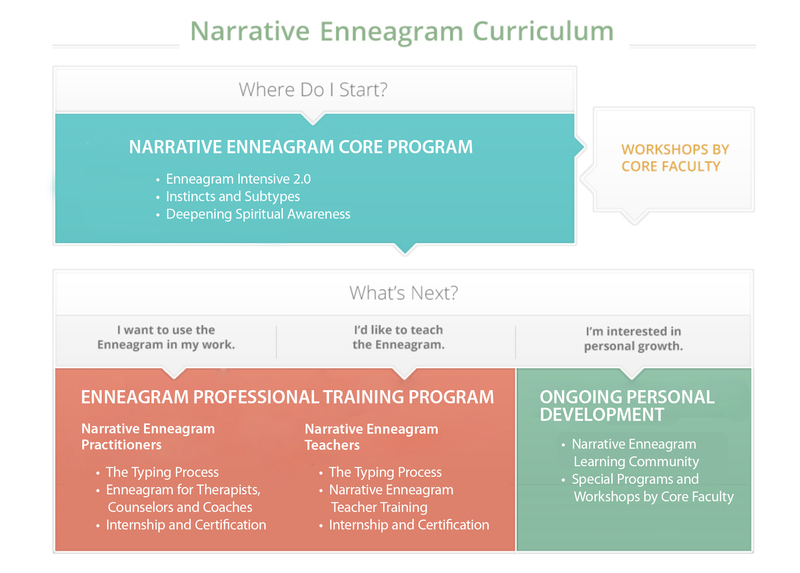 Our Narrative Enneagram Curriculum’s rich, integrated structure makes it easy to find just the right programs for you. The heart of the curriculum is the Narrative Enneagram Core Program, freestanding and complete in itself for your own personal development, or the starting point if you want to become proficient as a Narrative Enneagram Teacher or apply the Narrative Enneagram in your professional work. This is a living, growing and changing body of work that will continue to evolve as we gain new insights and enhance our teaching methods. Thanks to our generous donors, a limited number of scholarships are available. We are an IEA Accredited School and offer International Coach Federation CCEs for some of our programs. These foundational courses are freestanding and open to all for personal development. They also are the starting point for our other curriculum programs. We offer two certification tracks – one for aspiring Enneagram teachers, and one for therapists, counselors and coaches who work one-on-one with clients. Explore here to go deeper and work with the Enneagram in life and relationships.